Duh. 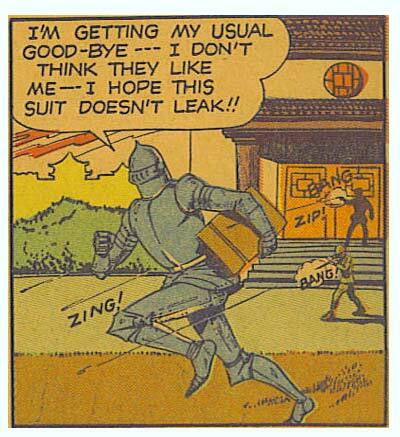 Obviously he’s the Tin Man’s cousin. He’s talking about lubrication oil……..yeah…..we’ll go with that explanation. @Rendu: “Omonomopia” is the sound of hunger for pi (pee), I’m pretty sure. The Iron Ace has a suit of bulletproof armor that’s made of the same stuff his bulletproof plane is made of… It’s NOT the same thing that Midaevil Plate was made of! And not to be confused with medieval omonomopia. Wow Iron Man must have been hit hard by the ressession to come up with THAT suit!